On Tuesday, July 10 at 3 PM, Seton Center, Inc., in collaboration with Morgan-Keller Construction and the Frederick County Chamber of Commerce, hosted a Ribbon Cutting and Dedication Ceremony to celebrate the successful construction of and move into their new building at 226 East Lincoln Avenue, Emmitsburg, MD. 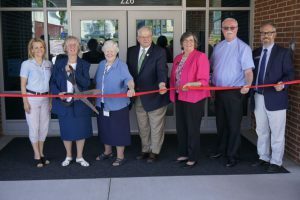 This bright, ecologically-focused building offers dignity and beauty to all who seek affordable clothes and household items at Seton Family Store, and their Outreach Office’s emergency and long-term resources that break down poverty’s barriers to success for partnering residents of northern Frederick County. For more information about Seton Center’s life-changing service with the community, call 301.447.6102. Picture – From left to right: Maryland House of Delegates District 4 Representative Cathy Afzali; Seton Center Director Sister Martha Beaudoin; Province of St. Louise Visitatrix Sister Catherine Mary Norris; Emmitsburg Mayor Don Briggs; Representative for State Senator Chris Van Hollen, Julianna Albowicz; St. Joseph Catholic Church Pastor, Father Martin McGeough; and Representative for Senator Ben Cardin, Robin Summerfield.